« Is 15% of the Global Clean Energy Market Good Enough? Methane, refrigerants, black carbon – these are all pollutants that fall within a class of global warming agents known as SLCPs, or short-lived climate pollutants. As the name suggests, each has a shorter lifetime in the atmosphere than their better-known cousin, carbon dioxide (CO2) – but at the same time each is more potent (and works in different ways) than CO2 at warming the planet. While SLCPs are a serious problem – responsible for nearly a quarter of the warming we’re experiencing today – cutting them is a huge opportunity to have almost an immediate benefit on slowing global climate change. On April 30, Governor Jerry Brown announced new statewide targets for all greenhouse gas emissions – stating by executive order that all GHGs must be reduced to 40 percent below 1990 levels by the year 2030. And, while many may be asking what more the state can do to cut more GHGs to meet the governor’s overall goal, on May 7 the Air Resources Board demonstrated that SLCP reductions are going to play a major role. The new SLCP plan (released as a concept paper) didn’t receive a tremendous amount of fanfare. That lack of attention isn’t surprising – the SLCP plan after all is about a specific class of pollutants that is named by a rather obscure acronym. But, while the pomp of the governor’s executive order to cut all GHGs may have stolen the show on April 30, the May 7 plan may have just as much circumstance. For example, the SLCP plan aims to cut all methane emissions by 40 percent over the next 15 years. For the energy sector, this plan puts California out in front of the effort to achieve the Obama administration’s overall goal of 40-45 percent reductions from oil and gas operations because it adds specificity of action (draft regulations have already been released) and expands the focus to even more sources of methane. For methane from the agriculture and waste sectors, California will have to begin a fundamental transformation of the way animal waste is handled and unlock new mechanisms to change landfills and composting operations. The new plan also shines a spotlight on the need to reduce natural gas leaks from trucks and power plants while creating new opportunities to work with other states and jurisdictions to cut pollution from energy and fuels imported into California. Similarly, for refrigerants – the ubiquitous set of chemicals like fluorinated gases (F-gases) that are used in millions of commercial and residential air conditioners, coolers, and other systems – the SLCP plan brings attention and solutions to the refrigeration industry. Requiring the use of environmentally benign natural refrigerants while phasing out use of the worst gases, ensuring compliance with leak reduction standards, and stimulating new investment opportunities for the use of newer, higher efficiency equipment are just a few of the solutions California plans to pursue. 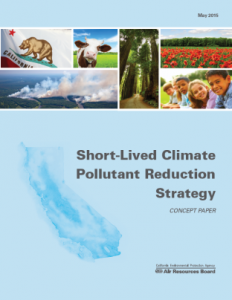 Additionally, for black carbon, or soot, the SLCP plan proposes to redouble the state’s effort to cut a pollutant that is responsible for the double whammy of significant climate change impacts and significant acute and chronic health damage. Forging new technologies for low emissions transportation and quickly implementing comprehensive improvements in the goods movement sector are two major opportunities. For nearly every portion of the SLCP plan, California has already begun to take action. For methane, this year the state is likely to complete the development of a comprehensive package to reduce leakage from oil and gas production, transmission, and distribution. What this new plan does is add to these existing efforts by seeking new transformational opportunities and putting all SLCP’s in the state’s cross hairs. Later this year in Paris, the world’s leaders will meet to discuss how to forge solutions that result in real benefits for the climate. With California’s new SLCP effort in hand, there will be one more major action for California to bring to the table – a plan that puts some teeth into Governor Brown’s executive order and demonstrates many exciting opportunities for California to meet the overall goal.